Halloween Wars is back for its fifth season premiering on Sunday, October 4, 2015 at 9pm ET and it’s more thrilling than ever. Under the watchful eye of host Rossi Morreale, five teams composed of a pumpkin carving expert, cake artist and sugar artist will battle it out as they create Halloween-themed edible displays that will send chills up your spine. In each episode, teams will face two grueling challenges. First, they’ll face off in the Small Scare, where they must create a Halloween-themed design in just 45 minutes. One winning team gets an advantage in the big battle – the Spine Chiller. In the end, their creations will be judged by renowned cake decorator Shinmin Li and Emmy-nominated make-up artist Brian Kinney, and a rotating panel of celebrity guest judges who are legends in the horror genre, including Robin Atkin Downes (The Strain), Benjamin Papac (The Walking Dead and upcoming film, GOOSEBUMPS), Bex Taylor-Klaus (MTV’s Scream), and Elvira, Mistress of the Dark. One team will be eliminated after each episode. In the end only one team will be declared Halloween Wars Champion, and walk away with a $50,000 grand prize. 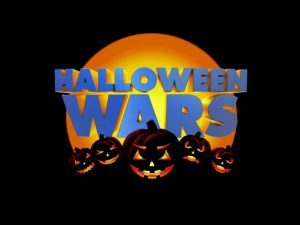 Halloween Wars returns, as five teams made up of an expert pumpkin carver, cake decorator, and sugar artist go to battle to create mind-blowing Halloween-themed displays, in hopes of winning the coveted title of Halloween Wars champion and a $50,000 grand prize. For the teams’ first competition, they must create Halloween-themed displays that capture a terrifying infestation. In the end, one team will be eliminated. Special guest judge, actor Robin Atkin Downes, joins host Rossi Morreale and judges Brian Kinney, Shinmin Li. The four remaining teams made up of an expert pumpkin carver, cake decorator, and sugar artist compete to create mind-blowing Halloween-themed displays that show a mutated and terrifying hybrid horror. Judges Brian Kinney, Shinmin Li and special guest judge, actor Benjamin Papac from The Walking Dead, will help determine which team will be eliminated. Three remaining teams made up of an expert pumpkin carver, cake decorator, and sugar artist go to battle to create mind-blowing Halloween-themed displays that capture the horror that results from robbing a grave. Judges Brian Kinney, Shinmin Li and actress Bex Taylor-Klaus from MTV’s Scream will help determine which two teams will move on to the final battle. For the final battle, two teams made up of an expert pumpkin carver, cake decorator, and sugar artist go head-to-head to create terrifying and scream-worthy displays of an undead dinner party. Judges Brian Kinney, Shinmin Li and special guest judge Elvira, Mistress of the Dark help determine which team wins the $50,000 grand prize. We love watching Halloween Wars, can’t wait to see what the teams come up with this year.